Galactic Suite Space Hotel is the brainchild of Barcelona-based architect and former aerospace engineer Xavier Claramunt. Image courtesy of Galactic Suite Group. Tourists can experience surreal sleeping arrangements and weightlessness. Image courtesy of Galactic Suite Group. Cocoon is a stand-alone, elliptical structure built from one continuous spiral floor. Image courtesy of Camenzind Evolution. The unique elliptical floor creates a new type of 'communication landscape' for the work place. Image courtesy of Camenzind Evolution. The Red Bull New Amsterdam headquarters feature a mosaic of the Mother of God as a DJ. Image courtesy of Sid Lee Architecture. The management office at the Red Bull Netherlands HQ. Image courtesy of Sid Lee Architecture. The beach hut features floor-to-ceiling mirrored panels that reflect the view from the beach. Image courtesy of Feix & Merlin. The proposed Water Discus Underwater luxury hotel is expected to be the largest of its kind. Image courtesy of Deep Ocean Technology. Large secured windows allow guests to enjoy picturesque views of the marine life in the Persian Gulf. Image courtesy of Deep Ocean Technology. Beige, beige, beige, vanilla and more beige. That is the extent of the colour palette of some of the most highly regarded designers when they set about creating a chic, cool environment. As one walks around rooms painted in egg shell, cream or off-white, it is easy to believe some aspects of interior design have become a tad too predictable. Thankfully, all over the world designers and artists are freeing themselves from conventional ways of designing and indulging in creative concepts. New schools of thought believe that what a room really needs is to be catapulted into space where the users are weightless and floating free. Or, if being flung into space isn’t really your thing, then how about the addition of warped, spiral floors or maybe a mosaic of the Mother of God with shades on spinning a pair of decks instead? "All over the world designers and artists are freeing themselves from conventional ways of designing and indulging in creative concepts." Fulfilling a childhood dream of being an astronaut is closer than one may think now that a project to build the world’s first space hotel has been announced. Galactic Suite Space Hotel is the brainchild of Barcelona-based architect and former aerospace engineer Xavier Claramunt from Galactic Suite Group. The resort is designed to orbit Earth at a distance of 450km and will accommodate a maximum of four guests and two astronauts for four to six days at a time. In the three-bed roomed suite, tourists can experience surreal sleeping arrangements and, according to their website, experience "a whole new world of sensory-perceptual experiences in weightlessness". Project leader Claramunt said the hotel will "offer a mixed programme of reflection and exercise to seize the unique physical conditions encountered in space." The space resort orbits the earth at a speed of 30,000km/h, allowing guests to see a new sunrise and sunset every 90 minutes. To prepare for space, guests will be flown to a Caribbean island, which will also be the launching base for the rocket, to train for up to 18 weeks. If you like the sound of it, you can reserve a place, but the cost per person for a three-day stay is a whopping €3m. Since January 2008, the hotel has received 38 bookings. Although it made a fine piece of art, the dramatic gravity defining stairs of M. C. Escher’s greatest work are an unexpected source of inspiration for groundbreaking design. Or are they? Camenzind Evolution, who designed Cocoon, would beg to differ. Cocoon is a stand-alone, elliptical structure located in Zurich’s Seefeld district which is built from one continuous spiral floor. "Cocoon is a stand-alone, elliptical structure located in Zurich’s Seefeld district which is built from one continuous spiral floor." The building is used as an office and all of the separate spaces are arranged along the rising ramp. 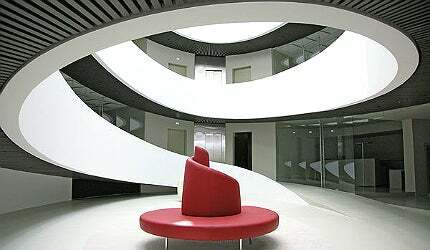 By disposing of the more traditional way of dividing a building by horizontal storeys, the elliptical floor creates a unique environment where a new type of ‘communication landscape’ in the work place can be found. This creates a unique spatial experience which can allow for a whole host of possibilities for increased interaction and cooperation in the work place. On the building’s design, Camenzind Evolution said: "Together, the various elements – lift, spiral ramp, segments and stairwell – constitute a clearly structured, versatile circulation system that provides for both the desired interaction and the necessary flexibility to accommodate alternative uses." Along with the spiral floors, another central aspect to the interior of the building is the main atrium which floods the building with light creating a warm and welcoming office environment. The ellipses expand as they go up leading to the dramatically wide skylight. Energy drink company Red Bull opened its new headquarters at the Media Wharf office complex on the northern side of the Amsterdam port area, in the Netherlands. Red Bull gives you wings they say, but if you’re not careful it can also make your office sprout a pair of airplane wings that will start a new life masquerading as your desk. This curious piece of interior design is the result of the creative designs of Sid Lee Architecture who have revamped Red Bull’s new headquarters in New Amsterdam, with stunning results. The energy drink company’s new headquarters are located at the Media Wharf office complex on the northern side of the Amsterdam port area in the Netherlands. Since the 1990s the area has been subject to a vast amount of regeneration. Completed in December 2011 the new building features huge, futuristic steel triangular metal structures, skateboard-like ramps and slopes, as well as a mosaic of the Mother of God as a DJ. The architects cited their main challenge as having to create a ‘mystical’ office space in such a simple, industrial building. To complement the core values and philosophy of Red Bull, the interior design of the spaces are divided based on the human brain’s two complementary sides; reason and intuition, good and evil, arts and industry and light and dark. Steel metal structures jut out of the office landscape and are painted with black oxides to represent a ship’s broken structure, paying tribute to the building’s former function as a shipbuilding factory. The office space is also taken up by large cave-like rooms that merge perfectly with the landscape. The building also features relaxation areas and a canteen area called The Diva which has a recording studio and a DJ booth. It’s not particularly common for a beach hut on the coast in Mablethorpe, Lincolnshire, UK, to be named after a Tom Cruise movie, but it is fair to say that there is nothing common about this particular beach hut. The ‘Eyes Wide sHut‘ beach hut was unveiled as part of the Bathing Beauties Festival where the challenge was to "re-imagine the beach hut for the 21st century". The hut, completed in 2007 and devised by architects Feix & Merlin, is a futuristically designed charcoal cube which features two ornate picture frames which hold floor-to-ceiling mirrored panels to reflect the view from the beach. This gives the user an ever present, moving picture of the landscape that surrounds the hut. Allan Curtis, managing director of Design & Display Structures who initially constructed the main body of the hut, said: "Having worked with the Design & Display Structures team previously, Tarek Merlin knew we would easily be able to handle such a complex and unique fast track project. "The finished property is a masterpiece of contemporary seaside design and we were thrilled to be part of this ambitious seaside regeneration scheme." To make the hut even more unique the mirrored panels are actually two-way mirrors, so that users inside the hut can enjoy a perfect, voyeuristic view of the landscape while passersby can only see a reflective mirror, leaving them oblivious to the going’s on inside the hut. If you get bored of the mirrored beach views then you could always stare at the full height graphic of a forest clearing which lines the side wall of the hut. "The proposed Water Discus Underwater luxury hotel will be located in Dubai, UAE, and is expected to be the largest of its kind." The sea is the best part of any holiday. You can relax or go for a healthy swim, go scuba diving or swim with dolphins. Polish firm Deep Ocean Technology (DOT) knows this and has decided to conceive the perfect holiday by cutting out the middle man and placing a hotel under the sea. The proposed Water Discus Underwater luxury hotel will be located in Dubai, UAE, and is expected to be the largest of its kind. The concept of the hotel was conceived by DOT in collaboration with researchers from Gdansk University of Technology. The structure of the hotel will consist of two discs – one above water and one underwater. Water Discus is a proposed underwater luxury hotel to be found in Dubai, UAE. The underwater section of the hotel will feature 21 rooms that can accommodate two people each. Large secured windows allow guests to enjoy picturesque views of the marine life in the Persian Gulf. The hotels rooms will be submerged ten metres below the water surface. Soundproof rooms and curtains that have a variety of transparency levels will ensure guests can enjoy their privacy. The hotel offers diving excursions for guests to explore reefs, rocks and wrecks in the ocean. A variety of water sports and other activities are all included to make sure guests can always be entertained. The project is still in the implementation phase and its construction timeline and budget are unknown.